Assorted Now employees and friends of its owner swarmed this wee web site yesterday, taking umbrage with what I had to say about the magazine’s boss (Hollett has no pony tail!) and approach (we think it’s okay to run ads trafficking in girls!). 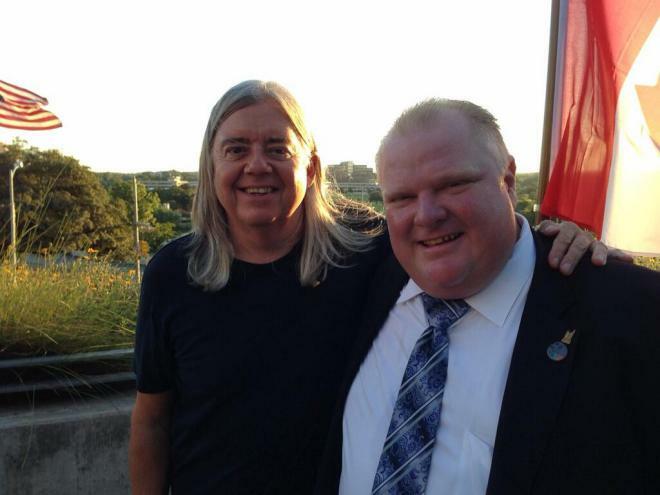 So, as expected, various other correspondents provided useful tidbits about the situational ethics of Now and its svengali – among them, the fun photo above with Now‘s boss, chumming with Rob Ford in the US, where fewer folks were around to point out how decidedly less-chummy he was with Mayor On Crack when back home. Here they are, with linkage. There’s more to come. Now’s boss apparently worked as unregistered lobbyist at City Hall. Now makes stuff up, and gets stuff wrong, to attack folks for doing the very thing its owner does (viz., photo above). Folks like the Torontoist, no corporate lackeys, call Now “petty,” “self righteous,” a paper that believes it is “morally superior” to everyone else. They claim to be feminist in their orientation, but they make lots of money running “display ads which pigeonhole all women into one category and degrade them,” says MediaWatch. That stuff isn’t from me: it’s what others have said. Unregistered lobbying? Chumming with the far Right? Corporate hypocrisy? Making a fortune out of ads which degrade women? Cutting news staff to fund non-news corporate ventures? All that sounds pretty corporate, to me, but what do I know? I don’t make the kind of dough Michael Hollett does. And, what’s more, there’s no photos of me around, hugging Rob Ford. I was a punk. I beat hippies with pony tails. Private media will always be a right wing, corporate media. The point is profit and really nothing else. They will print whatever brings in readers. An owned media has an agenda to make money from whatever segment of society they purport to serve: Globe and Mail the business elites, The Star educated urbanites, The Sun festering drooling troglodytes, and The National Post festering less drooling troglogytes that occasionally bathe, Now Magazine the coffee shop and arts crowd. None demand the overthrow of the state, a workers paradise, a social restructuring to a “anarcho-syndicalist” form of capitalism. It is hysterical to call any privately owned media leftist and those who do really don’t know what “leftist” means if it actually has any meaning for those who scream the term as some sort of warning. Really, ask someone what they mean by “Leftist” and most of the time it comes down to the fantasy of evil pony tailed latte drinkers who speak in full sentences and nothing to do with what is actually being said. The most that we can hope for is a media that is a constant pain to power, that is a court jester, that is uncomfortable to those whose asses have been in the seats of parliament too long. That’s why public radio is important and any assault on it (beyond the demands of competence and function) is a long term threat to democracy. So what does the photograph of Rob Ford with Linda Tripp have to do with this story?